For Christmas my sister sent me the book The Sword of the Lord: The Roots of Fundamentalism in an American Family. It didn’t take long for me to understand why she would choose such a gift for me. The book is all about the shared history we have with the author, Andrew Himes, grandson of John R. Rice, one of the founders or quite possibly considered the founder of fundamentalism. Her note inside promised I wouldn’t be able to put it down. I thumbed the many pages and sighed deeply with a mental “yea, right!” I read, yes, but mostly historic novels and the like. Still, in my thank-you note I promised to read it after I’d finished the books ahead of it in my queue. You’re wondering what I mean about “shared history” with the author. Here’s a quick synopsis so I don’t lose you too quickly. 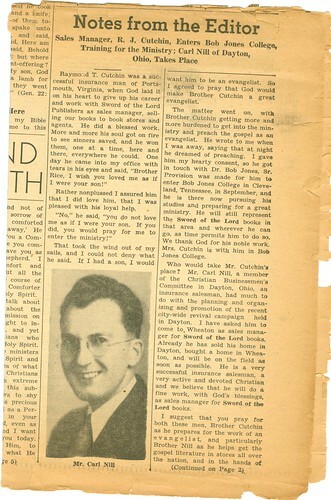 My family lived in Dayton, Ohio, in 1945-6 when John R. Rice brought one of his revival crusades to town. This kind of event was right up my dad’s alley. He had a heart for evangelism and would surely be part of the committee that organized the event. Apparently John R. Rice recognized potential in my dad and recruited him to come work for his organization, headquartered at the time in Wheaton, Illinois. This is the top of the publication that announces my dad’s new assignment. Much grief was left behind with family in Dayton as our family of five moved two states over to follow God’s call. 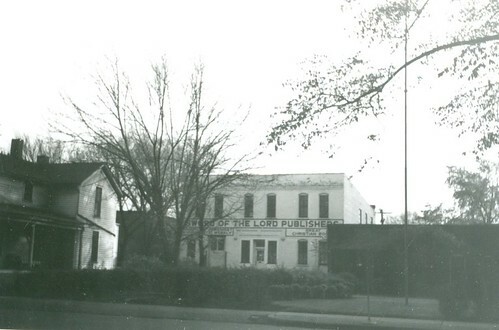 Here’s where my dad went to work every day while my family adapted to its new life. I was a year old, so it didn’t have much impact on me. To keep my promise to my sister I looked on Amazon and discovered The Sword of the Lord in Kindle for 99¢. I quickly made the transaction and I strongly recommend you go and do the same before someone realizes they’re practically giving away an amazing book! Hurry, I mean it. If you can’t get into it (there are parts that could bog you down) you’ve spent less than a dollar. I will gladly refund it if you don’t get that much out of it. So what I’m saying is my sister was right. The book was full of connectors to my Wheaton days. Andrew reported his obvious need of salvation at age five when he stole a Mars Bar from the popcorn store on Front Street. How many times did I walk the mile and a half from home to downtown Wheaton to buy popcorn or a strip of white paper with droplets of pastel candies stuck to it? Don’t misunderstand. I don’t want you to read this book so you can relate to my childhood. I tell you these things only so you understand why I, about the furthest a person can get from considered intellectual, devoured this book. Perfect timing, to be recovering from back surgery with excess time on my hands. Picture me in wakeful nights, burrowed down in the blankets so my dimmed Kindle light didn’t disturb the man next to me. Or don’t. I learned so much! The facts (all backed up with pages and pages of indexed resources) of how American history correlated with religious fervor and the misguided misdeeds of so many helped me figure out who I am and why I hold some, may I say, fundamental, beliefs so dear. 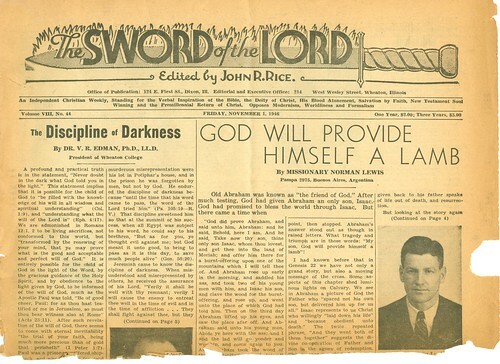 Andrew Himes, grandson of John R. Rice, never once, not a single time, expressed disrespect for his granddad, though they held diametrically opposed viewpoints on nearly every aspect of fundamentalism. He gets high marks in my book for that! Read this book! It is chock full of information (expect, like I said, to get bogged down from time to time) and is carried along with the personal experience and perspective you might expect from the author, filled with caring emotion and distraught disdain all at the same time. Ninety-nine cents! Read it and let me know what you think. 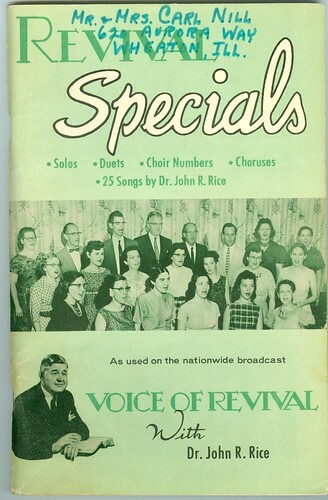 And just for fun, I’m including this songbook cover (and inside cover) that remains in my collection. 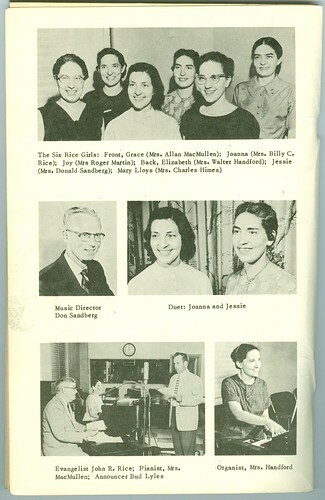 Both of my parents are pictured on the front. My dad is fourth from the left in the back row, my mother second from the right on the middle row. Mother of Andrew Himes is in the front row, third from the left. We like to play the game “What if…..?” I’m thinking right now: “What if John R. Rice had not recruited my dad to work for him back in 1946?” It boggles my mind. That’s Rice on the left. Bonus points for naming the dude on the right. PS: Please, read this book! I have shared personal and Wheaton history, etc. And this sounds very interesting. I’ll get it in line to read. Or maybe it will elbow its way ahead of some others. Thanks for the interesting post. Wow! So many memories. I will have to get it. Sherry, what a marvelous review! I really appreciated reading it, and you made my day. And by the way, in that photo of the choir, my dad is third from the left in the back row, standing right next to your dad. I am grateful to connect with you. 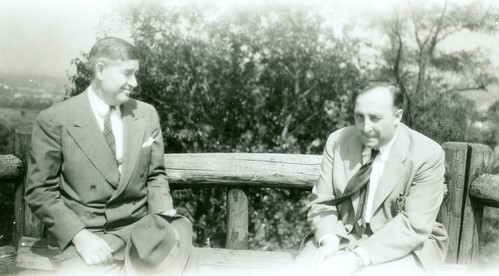 Incidentally, according to my aunt Libby Handford, “the dude” in your picture with John R. Rice is Bill Mann, extraordinary engineer from California, who came to work for my granddad as an advance man for his city-wide revivals, circa 1944-1950.